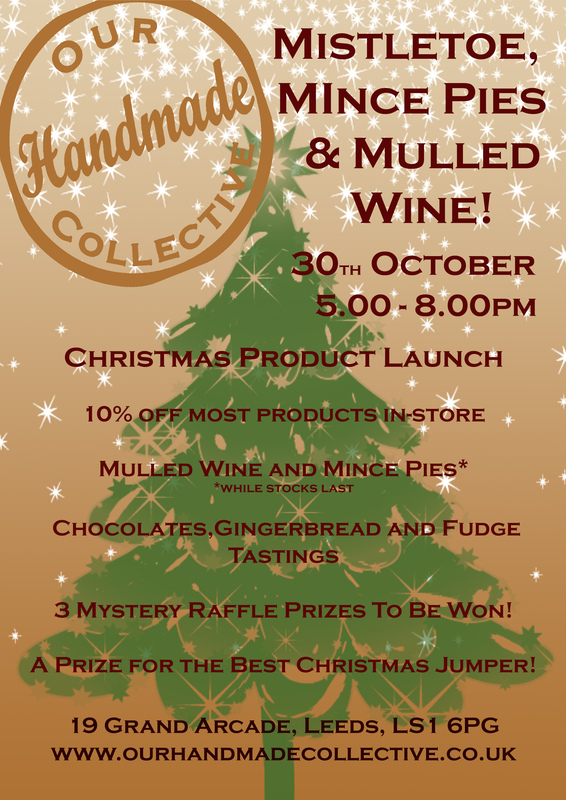 Mistletoe, Mince Pies & Mulled Wine! There are only 62 days until Christmas!! 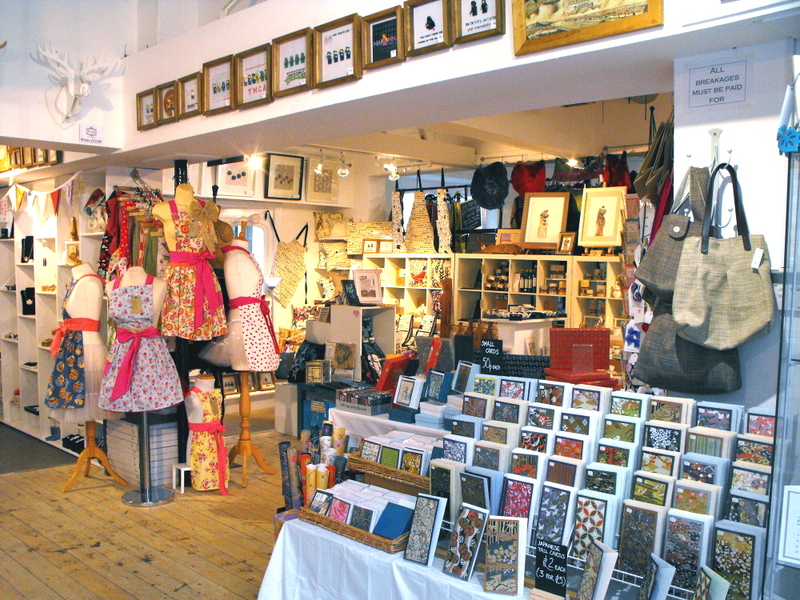 Don’t panic, if you haven’t started Christmas shopping yet, we’re waiting for you at Our Handmade Collective. Even better, we’re going to make the task FUN. Bucket loads of our sellers will be in attendance on 30th October wearing daft Christmas jumpers and handing out Mince Pies & Mulled Wine. You can even kiss your sweetie under the Mistletoe. If that’s not enough to tempt you, how about 10% off hundreds of products in store for one night only? Handmade, unique and a bargain. Why, you might just get all your presents in one go! 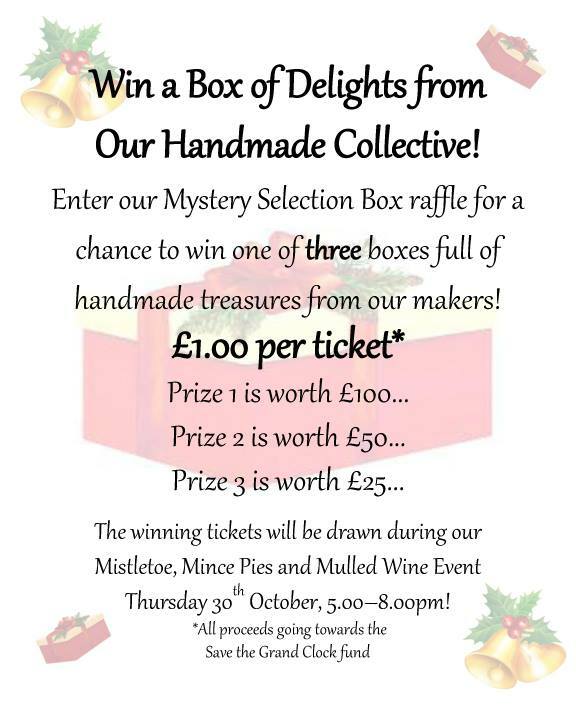 On the night we’ll be announcing the winners of the Box of Delights raffle! Get your ticket in store now for just £1. Proceeds go towards saving the beautiful clock in our Grand Arcade and restore it to it’s former glory. 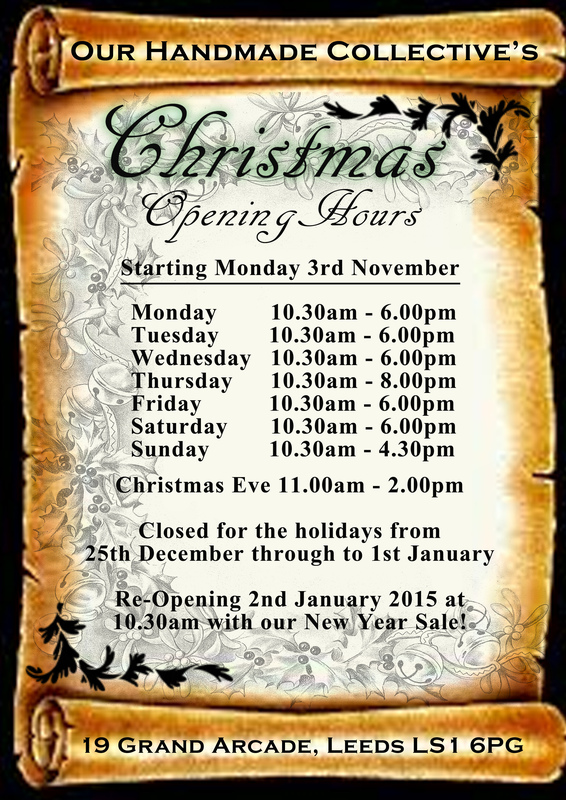 As well as being an unmissable night, our festive party marks the start of our Christmas opening hours. We’ll be open SEVEN DAYS A WEEK and for those who can’t stomach weekend shopping, you can pop in after work on a Thursday until 8pm! 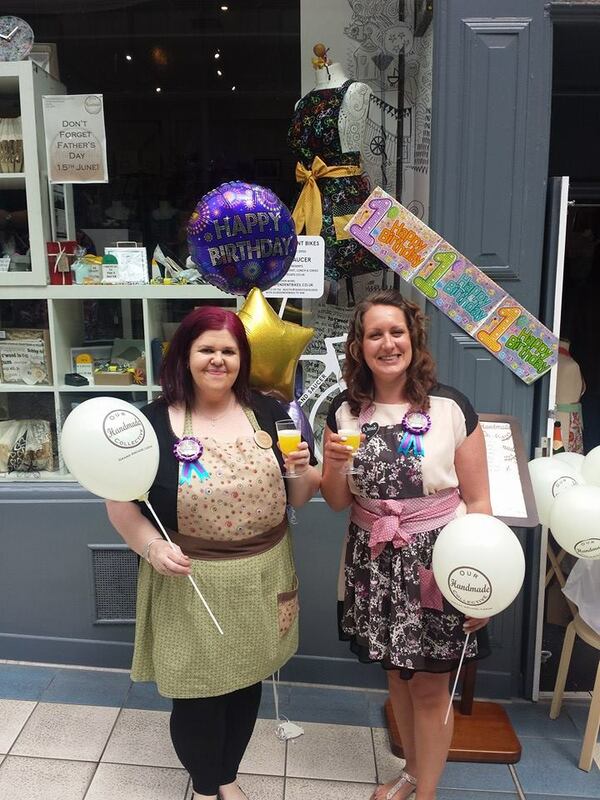 Thanks to everybody who came and joined in our first birthday celebrations last weekend. We had so much fun and it was so lovely to see the Grand Arcade buzzing with excitement. We really enjoyed seeing some of our favourite customers and meeting so many new faces. We hope you found the perfect gift in our shop and that you will spread the word about us to your friends. (Co-founder Natalie outside the shop – above) (Our yummy birthday cake! – above) (Both co-founders Claire and Natalie raising a glass to celebrate our very successful first year of trading – above). You are invited to Our Birthday Bash! 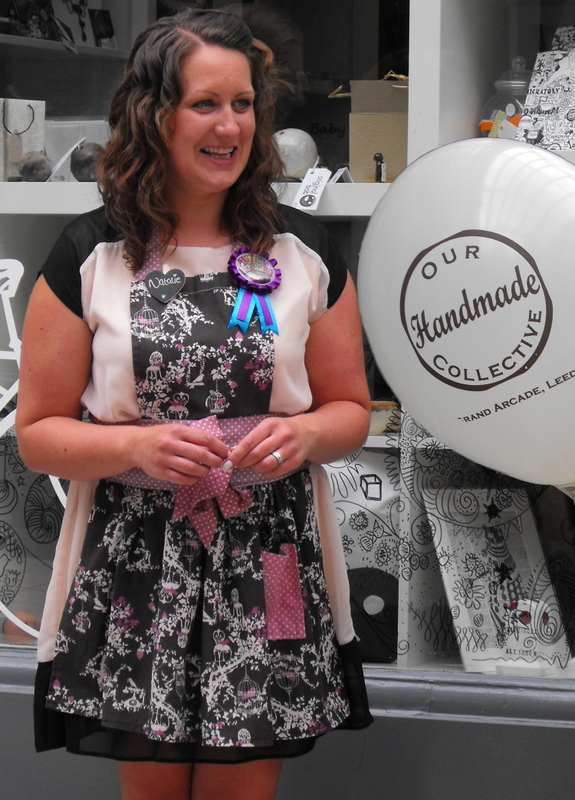 We cannot believe it but Our Handmade Collective is almost one year old! 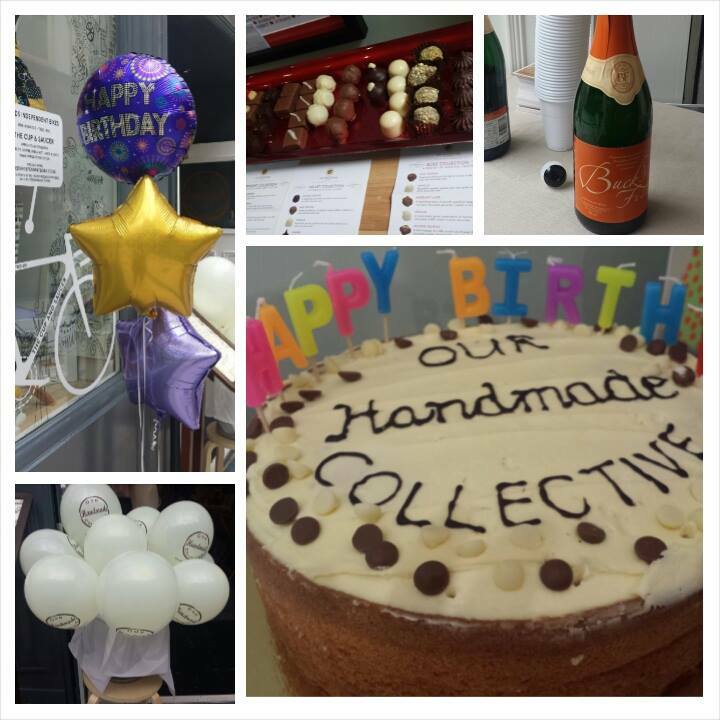 On 14th June we will have been trading as a collective for exactly one year. So to celebrate we are having a party and you are all invited! 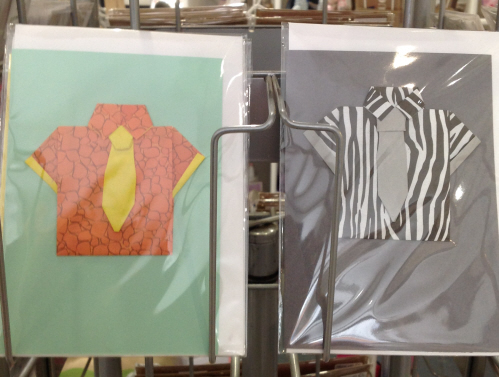 Chloe from Life’s Big Canvas will be helping you to make an origami shirt, just like these on her Father’s Day cards (see photo below). This activity is free to participate in but any donations to the Grand Clock Fund would be gratefully received. Sarah from Button Bears by Gifted With Love will be showing you how to make a mini bear keyring (cost £1 with 25p from each bear going to Grand Clock Fund). There is also a Raffle with a Grand Prize of over £250 of handmade creations. You can buy your tickets for £1 from the shop in Grand Arcade, Leeds. All proceeds will be going to the Grand Clock Fund to restore the Animated Clock in Grand Arcade. The winning ticket will be drawn at our Birthday Bash! You can also enter our caption competition by clicking here to go to our Facebook page and enter your comment. You can decide how you would decorate one of Oh Deer’s deer heads and what you would call your creation. 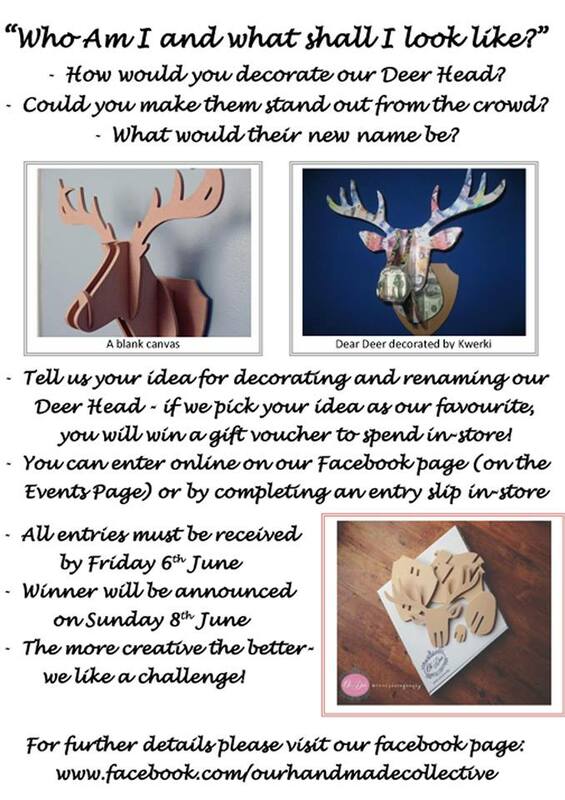 Enter our competition in store to see your deer head made and win a gift voucher. Be sure to enter before the 6th June!! Oh Deer will also be allowing a generous 20% discount on any deer heads purchased during our Birthday weekend! In just one year we have gone from strength to strength and expanded from the original 19 sellers to nearly 55 of us now! That is down to you and your lovely comments and support – Many Thanks. 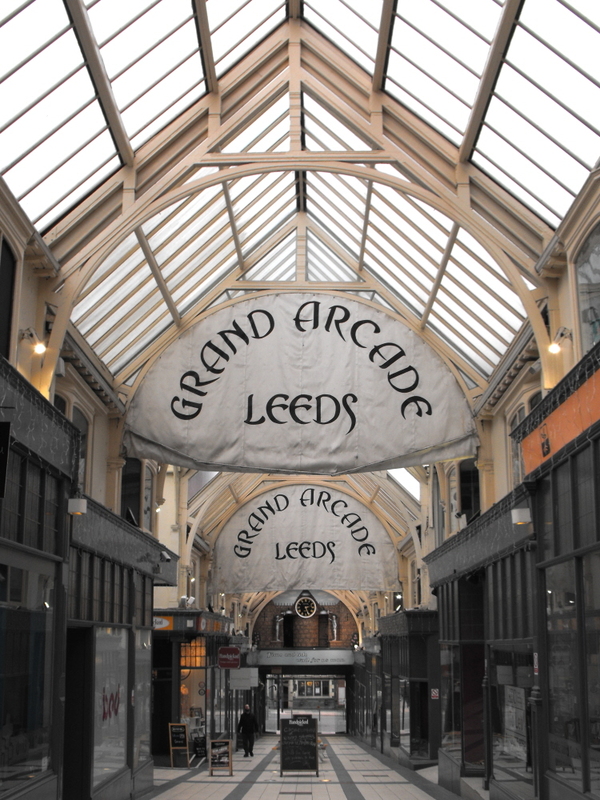 Hope to see you at the Birthday Bash – bring a friend or the family and have fun in the Grand Arcade, Leeds Saturday 14th June. Or if you are in Leeds on Sunday 15th June to watch the #SkyRide then pop by and get a last minute Father’s Day gift. Handpicked Hall has had some changes with most of the businesses moving upstairs to be under the beautiful glass roof. To showcase these changes they are having a Relaunch Weekend from Thursday 27th February to Sunday 2nd March 2014. As we like any excuse to have a party we are having a VIP event on Thursday 27th February 6-9pm. We have an evening of celebration, entertainment and shopping planned. 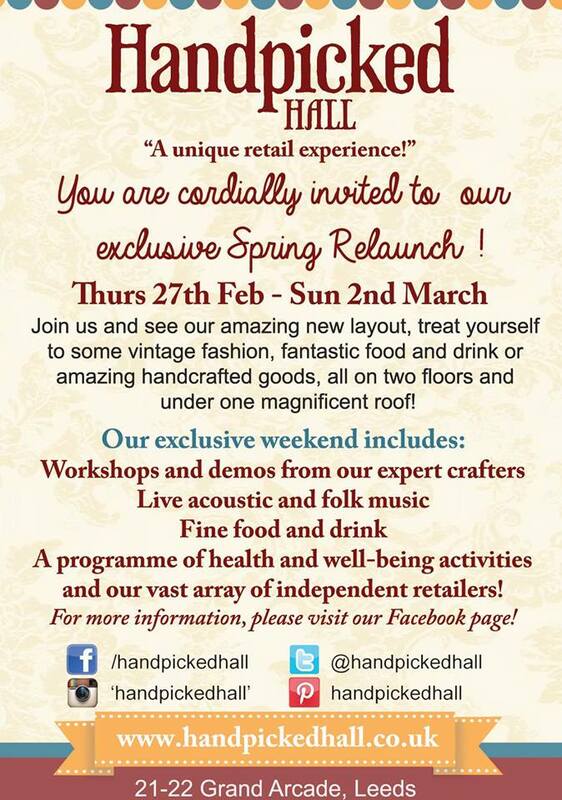 Plus the chance to browse around the whole of Handpicked Hall in comfort and style! 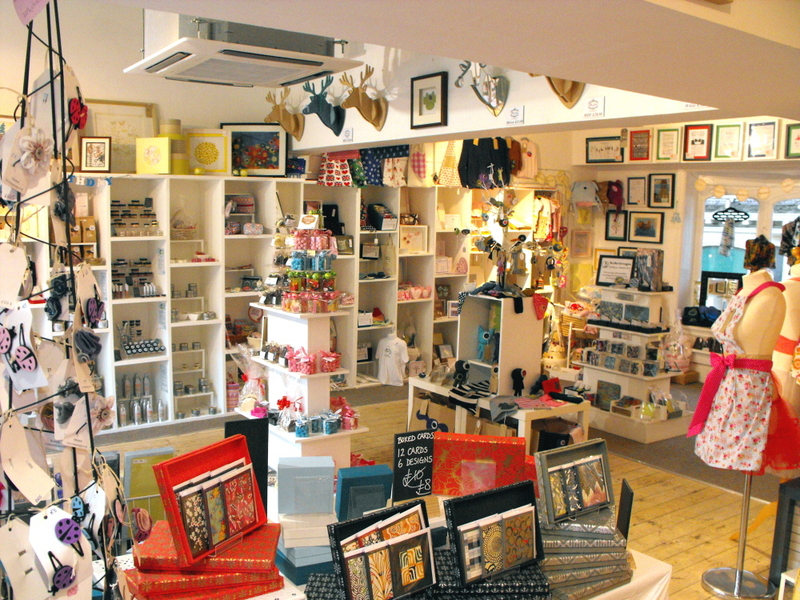 Don’t forget the new entrance into Handpicked Hall is from Grand Arcade itself and we are upstairs!